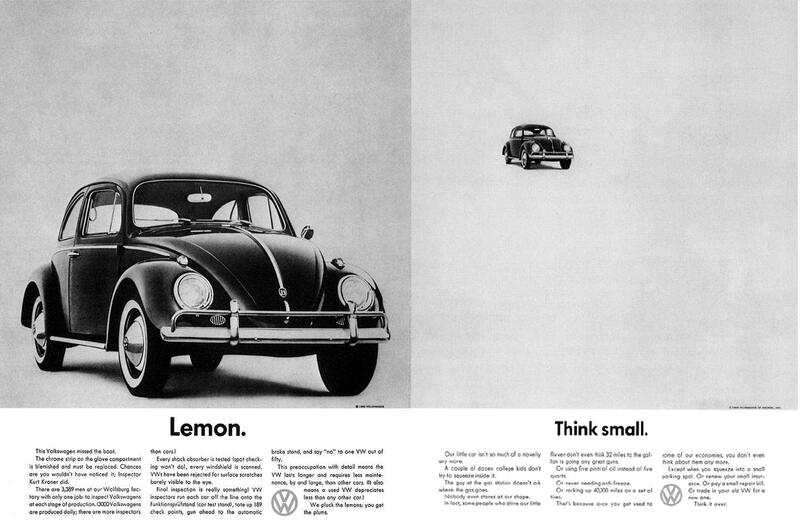 Why the thinking behind ‘Think Small’ is still relevant. In our hyper-connected, digital world there is more information produced each day than was produced in the prior thousand years of human history–and it’s increasing every day at faster speed. Consequently the attention span of consumers is shrinking at the same rate. In an age of endless texts and tweets, literacy suffers. The Internet is junk food for the mind. The more information created, the less attention is available. Consumers are now surrounded and protected by a sea of white noise. The tactics of simply ‘decorating’ customer-facing marketing are over. No one is listening and nobody cares. Brand marketers and designers are no longer in the communications business but rather in the engagement business. To engage consumers, one must connect with them where their memories are created–at a deep emotional level. In the end, it’s not facts people remember but feelings. We need to connect with people in a way that goes beyond just selling a product and generate something that can credibly be called a movement. There must always be a powerful idea at the core. McGraw-Hill Professional. Shared with permission of McGraw-Hill Professional.